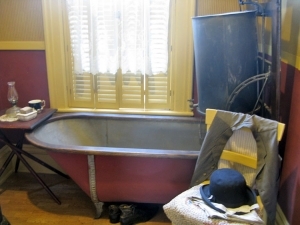 The second floor of the Gardner House Museum contains four rooms that are open to the public: two special exhibit rooms that are changed periodically and a Victorian bathroom and bedroom. You may click on any photo below to view the gallery of photos for the second floor. The southeast exhibit room will have a new exhibit by the beginning of July 2018. It currently has 400 photos of Albion men and women who served in World War II. Each photograph is numbered for identification. 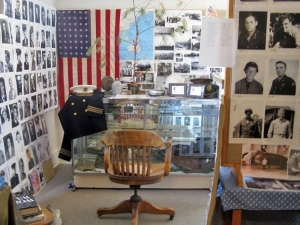 A large collection of WWII memorabilia includes uniforms, helmets, decorations, mess gear, and flags, which were donated by veterans or their families. Three Tuskegee airmen (Grover Crumsby, pilot; Richard Weatherford, pilot; and Finis Holt, radio man) moved to Albion after the war. The SS Albion Victory 624 Liberty ship, named after the city of Albion, was launched in late 1944. It served in WWII, and the Korean and Vietnam wars. The southwest exhibit room contains photographs and artifacts that relate to the Albion Malleable Iron Company and its later transformations, Hayes Albion and Harvard Industries. The Albion Malleable Iron Company, a vibrant locally owned and controlled factory which was in existence from 1888 until 1967, was the major economic factor in Albion’s history in the early 20th century because it brought hundreds of residents to the town and formed the basis of Albion’s diverse population. Folks originally from Italy, Poland, Holland, Mexico, and many other countries came to work and settle in Albion, as did a large African-American population from the South. In 1967 the company became Hayes Albion, and it officially closed in 2002 under the name Harvard Industries. The flush toilet (notice the water reservoir located near the ceiling) in the Victorian bathroom came from Albion's train station. The metal bathtub has a kerosene burner to heat the water. Examine the medicine cabinet with its collection of personal grooming and health care items. Located just outside the bathroom is a beautiful Victorian walnut hall tree adorned with straw hats, umbrellas, and parasols. 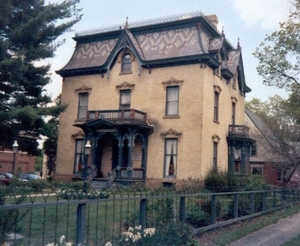 A Victorian style bedroom is in the northwest corner. It features a carved walnut bedroom suite with a large headboard and footboard and matching dresser with a marble top and mirror. Notice how much smaller the bed is compared to today's queen- and king-size beds. Next to the dresser is a baby carriage with large steel wheels and a wicker basket. In the corner is a cradle brightened by a baby quilt from the Farley family. 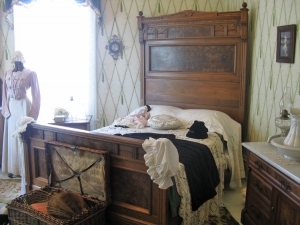 Step into the closet to admire the plain colored Victorian men's and women's clothing. Notice the few clothes in the closet compared to our closets today.